In the mid 70s a an Australian Surfer who was travelleing to Africa from Srilanka was shipwrecked at the Maldives. He was amazed by the Maldivian waves, he stayed on married a local girl and opened his own surf agency and ever since it's been a swell ride. And recently Maldives has been hosting international surfing competitions such as the O'neill Deep Blue Open in 2001, which has put Maldives on the international surfing map. The surfing season is March to October, with the biggest swells occurring in July and August. Wave sizes range from 4 to 8 feet . while the temperature is at an ideal varying between 24 to 30 degrees Celsius. 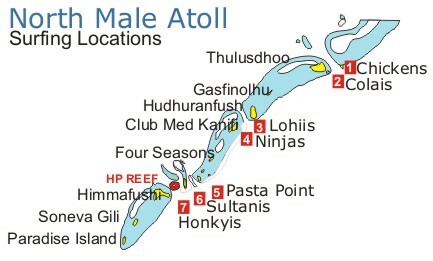 Most of the best known surf points are located in North & South Male Atoll. Chickens - Villingilimathi Huraa (Kuda Villingili) Uninhabited Island . Eastern reef of North Male Atoll. Kates - Boduhuraa, near the Palm Tree Island Resort. 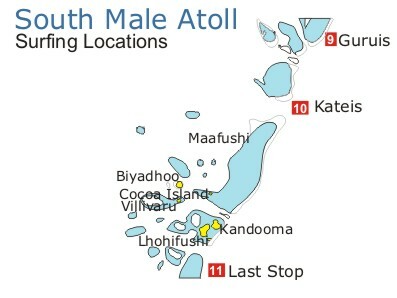 Eastern Reef of South Male Atoll.